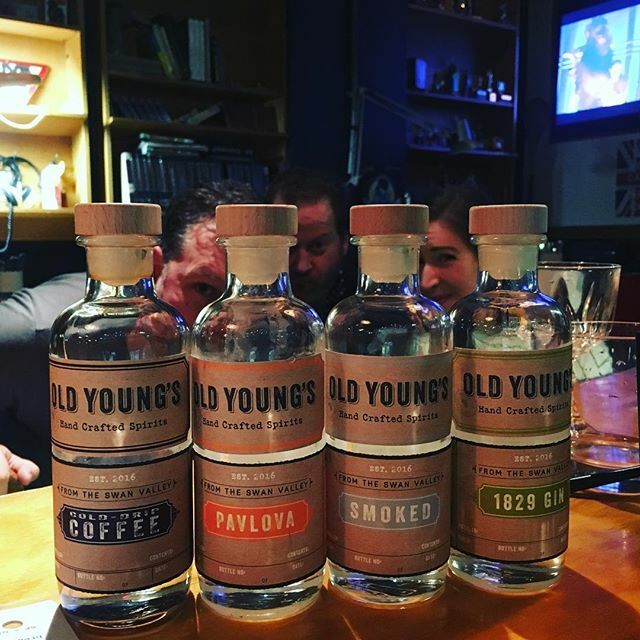 Old Young’s produces premium quality, hand crafted spirits by blending tradition and new techniques with a twist of unusual flair in the heart of the Swan Valley. What was formerly known as the Wild Swan distillery, has been given the air of new life after distiller James Young took over the reins of the decade old company and re launched it as Old Young’s. 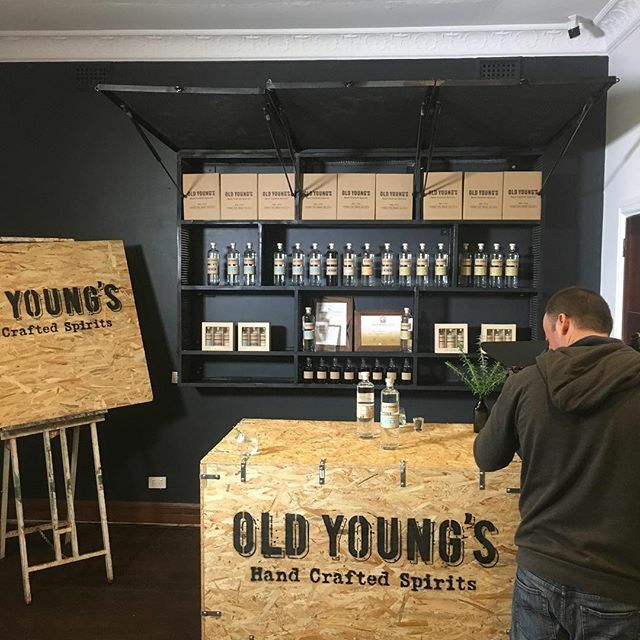 Old Young's detailed and amusing manifesto outlines the business and distillers thoughts on life and offers insight into the brand’s ethos. It includes advice to; ‘work smart, embrace silly, get dirty (but) stay clean, don’t be s*it, show some f*cking passion, there is no good reason to do a half assed job, drink better’ and ‘making money doesn’t count, making babies does’ (it is really worth reading in its entirety here). 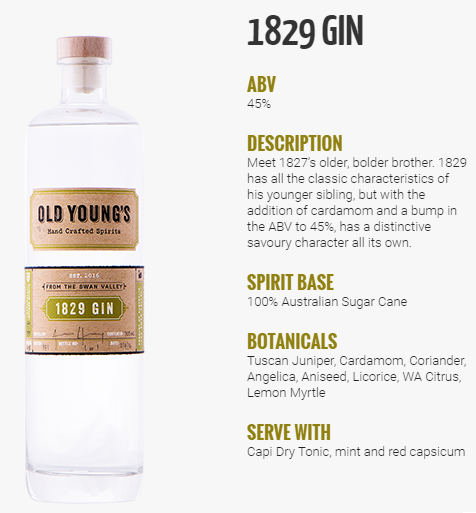 As well as some solid life advice, it encapsulates the passion, hard work and the cheeky sense of humour that has gone into birthing Old Young’s and its fantastic spirits. Even though the takeover came just over 12 months ago, James has already made waves, taking out the title of Australia’s best vodka producer for his champion vodka Pure No. 1 at the Australian Distilled Spirits Awards. He also collected a silver for his Smoked Vodka and scooped up three bronze for his Pavlova Vodka, 1829 Gin and Old B.A.G (Barrell Aged Gin). These new products have also seen success at an international level winning a gold, silver and two bronze medals at the International Wine and Spirits Competition in Hong Kong last year. 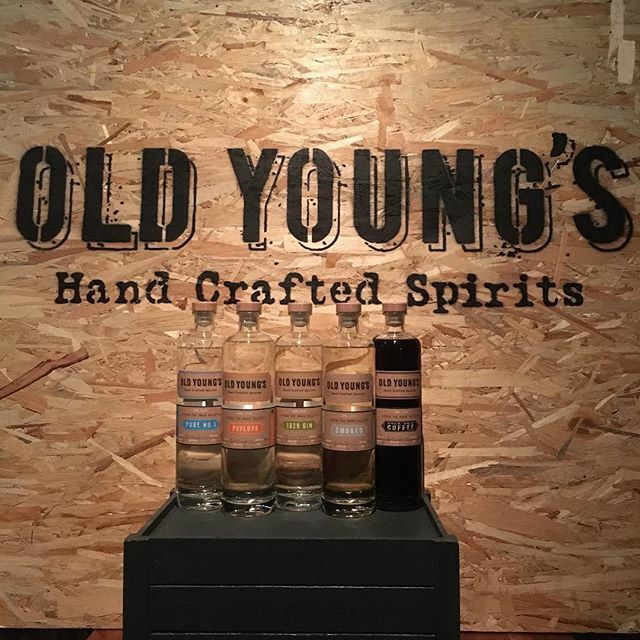 Old Young’s other creations include their 1827 Gin, Spiced and Cold-Drip Coffee Vodkas. James attributes this success to having a clear philosophy when it comes to vodka and gin. While he holds in high regard the importance of creating new and innovative spirits, it must never fall into the trap of creating novelty products. Although they pride themselves on producing unusual flavoured vodkas, they must be a sensible way to drink the product- whether at home or in a cocktail bar. James says this philosophy serves him well even with his traditional Pure No. 1 Vodka and his gins. 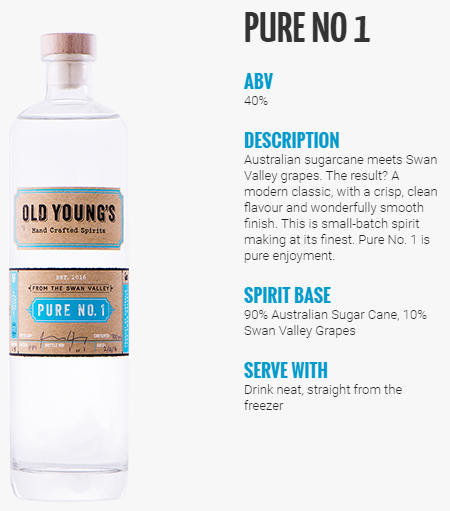 For the vodka he uses local Swan Valley grapes which he blends with a traditional sugar-cane base, and with his gin it is all about the flavour and staying true to the great traditions of London Dry Gin while adding a subtle twist. Another important aspect to creating these award winning spirits is James’ commitment to using only the highest quality ingredients possible. Where most of his spirits are made from excellent local produce, he does have some exceptions when it doesn’t measure up to the best produced globally. One case is the juniper berries (one of the most important ingredients of gin), which is known for being best produced in Tuscany. Near on impossible to buy, James determinedly tracked down an importer to England, flew over and convinced them to supply him with enough to create all of his gins. Not all ingredients have such a long distance to travel however, with their citrus coming conveniently from the Swan Valley itself. A new gin product in the works will pay homage to WA as it is based around the native six season’s calendar, and uses six native botanicals. It may surprise you to learn that James hasn’t been distilling his whole life. This is in fact his fifth career in 20 years. The long and varied path which has led him to his calling of distilling includes ownership of a graphic design agency, head coach of the Lithuanian National Women’s Hockey Team, work in some of Perth’s biggest advertising agencies, sports administration at Hockey Australia, Netball WA and finally the CEO at Swimming WA. Although not the most obvious career choice considering his resume, he says his lifelong journey to discover ‘what he wants to be when he grows up’ has finally ended as Young says he has finally found his calling. A recent discovery that his great-grandfather was once accused of running sly-grog in the early 1900s, might lead us to believe it all boils down to genetics. 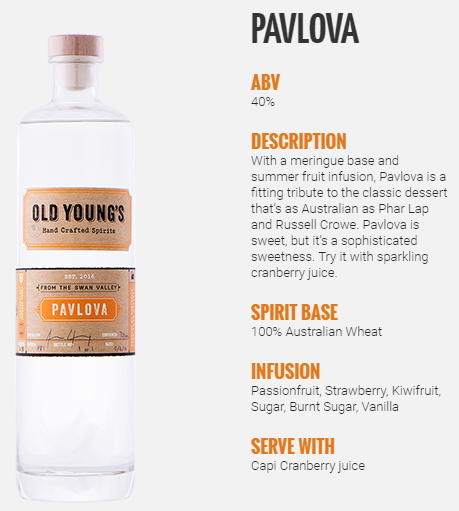 If your tongue is tickling with the need to try these tasty spirits (Pavlova is definitely my favourite and worth a try- it reminds me of Allen's peaches and cream lollies) you can head down to the tasting room at the distillery in the Swan Valley, or order it at a handful of bars including Alfred’s Pizzeria, Bathers Beach House, Enriques School for to Bullfighting and Frisk Small Bar (see the full list on their website). It is also available for purchase direct from the source, as well as The Re Store or Gangemi’s Fine Wine and Food, with more to come very soon. Located at 10581 West Swan Road, Henley Brook. Open Wednesday through Sunday from 12pm to 5pm. Find out more on their website, Facebook, Instagram or Twitter.